Today, the Tennessee State Quarter Coin remembers when a young gentleman found stolen treasure in an old stump on March 21, 1868. Forty Thousand Dollars Worth of Valuable Papers Found in an Old Stump. From the Jackson (Tenn.) Whig, March 21. On last Sunday evening, as little Johnny Trice, a son of E. J. Trice, Esq., of this city, was playing in a lot in the rear of his father’s residence, and but a short distance from the Mobile and Ohio railroad depot, he discovered a piece of paper projecting from the top of an old decayed stump. It happened that a revenue stamp was affixed to that portion of paper exposed, which attracted the attention of the little fellow, who is not more than eight years old, and caused him to “go for it,” as he imagined it was a piece of fractional currency. Pulling the paper from its partially imbedded position, he discovered that there were others buried deeper down in the loose trash, with which the stump was filled. Gathering up all the paper he had found, he carried them home and showed them to his father, to whom he told the story of their discovery. Mr. Trice saw at a glance the great value of the papers and immediately repaired to the spot where they were found, and instituted a more thorough search, which resulted in bringing to light two more papers, one of them a note for a large amount. Through the kindness of Mr. Trice, and Mr. W. D. Clark, Agent of the Express Company in this city, in whose hands the papers have been placed for safe keeping, we were permitted to examine them all, and here give a description of several of the most important. One note, dated New York city, March 4th, 1868, reads: Ten years after date, I promise to pay to the order of Daniel Ball, the sum of thirteen thousand and five hundred dollars, for value received, signed, Ira A. Allen. One note, for $8000. dated New York city, February 24th, 1868, given by H. B. Hewlett, and made payable to Daniel Ball. One note, for the same amount, in favor same, and given by Charles H. Stewart, No. 8 Pine street, New York. Among the papers are several other notes, some for a considerable amount, with credits bearing various dates upon them. Also several mortgages on property in Michigan, in favor of Daniel Ball. There is also an insurance policy, on the steamboat “Hudson,” for $15,000. There is no doubt as to the ownership of the property. The papers evidently belong to Daniel Ball, if living, or to his heirs, if dead. The telegraph has been used to find the whereabouts of the gentleman, but nothing has yet been ascertained of his locality. It is highly probable that the person to whom the papers belong was robbed either on the cars, or at the depot in this city, by some of the accomplished thieves that have of late infected this community. The greatest mystery to us is, why the loss of such valuable documents has not been advertised all along the route, by the party who lost them? If Mr. Ball does not make his appearance soon, we will be forced to believe that a darker crime than mere robbery has been committed. Mr. Daniel Ball, owner of the valuable papers found near the Mobile and Ohio railroad depot at this place, some weeks ago, made his appearance on Tuesday and recovered his property. Arriving on the 12 o’clock M. train, Mobile and Ohio road, he started out of the car to take passage on the Mississippi Central, when he was met in the narrow aisle by a man whom he recognized as one of the passengers. At the same time he was crowded in the rear by someone who appeared very anxious to pass him. To escape from being crowded Mr. Ball took refuge in one of the seats, when the two men passed each other and went out of the car. Having often been hustled about before in the same manner, he did not suspicion that there was anything wrong in the men, but attributed their conduct and hurried movements to a desire to obtain eligible seats in the Mississippi Central train. It was several hours before he missed the package containing the papers. He then recalled the hustling movement on the Mobile train and was satisfied it was there the papers were stolen. He states that two notes, for three thousand dollars each, are still missing. Jackson Whig, April 11. 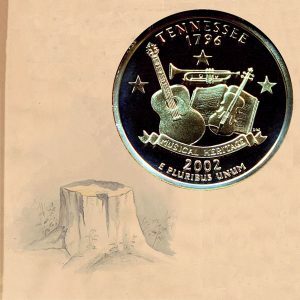 The Tennessee State Quarter Coin shows with an artist’s image of a stump, circa 1860s.